With Thanksgiving just over a week away, and the current situations around the world, I find myself contemplating my life and the things I take for granted. What is the number one thing I take for granted? My Lord and Savior. I remember to say my morning prayers, my grace before meals, and my evening prayers, but do I think about Him before I kiss my child's scabbed knee? Do I remember Him when I am crocheting a baby blanket for a friend? Do I talk to Him before I read a book? 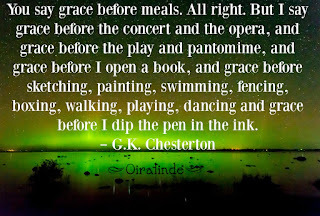 G.K. Chesterton was a very wise man. Shouldn't we all remember to say grace before every action we do? Living life in every way is a praise to God. When we live our life the way Jesus taught us, we are living a prayer, but remembering Him is so important. 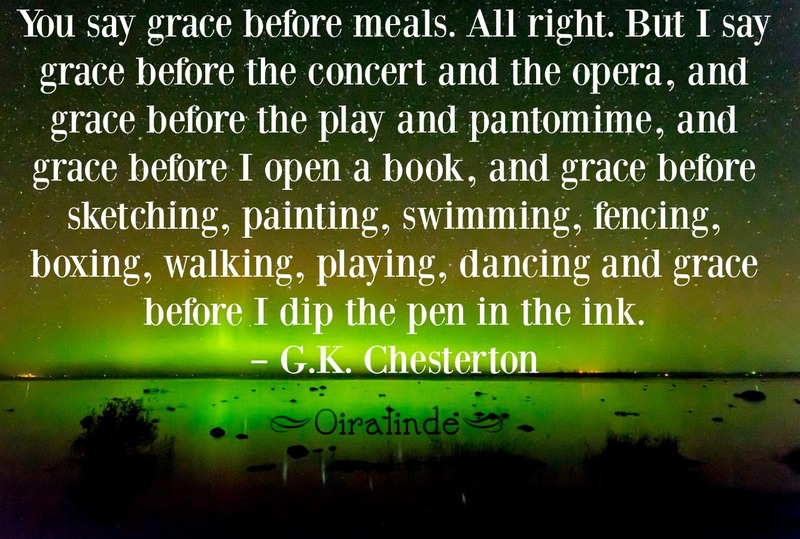 Where in my day could I have inserted a grace and been thankful? There are so many moments I could stop and say grace and thanks to God but I forget! It isn't that I completely forget, but we get caught up in the day and living life. My goal is to have more graceful thanks in my life. Perhaps I can help turn my mindset and let go of some of the anxieties in my life by remembering it is God that has given me this life and to be thankful for it all, even if I feel anxious about parts of it. He is bigger, and for that I am thankful.